Emma (ADOPTED!) is an extremely sweet, gentle and incredibly loyal girl. She is around 4 years old, and weighs 40 lbs. She is very timid around people, and currently the only people she truly trusts and loves is her core family. We have only had Emma for two months. With our family, she is extremely loving, happy, obedient - willing to do anything we ask of her. With my children, Emma is the gentlest dog I have ever met. My two year old daughter can put her hand in Emma’s mouth, roll on her, or do anything a two year old will do, and Emma just snuggles in or moves away from her, never showing an ounce of aggression. Emma is a low energy dog. Her favorite pastime is lounging on the couch. Outside she will occasionally do some exploring, but mostly she likes to follow you to wherever you’ll be, and make a bed in a shady spot to lounge some more. She likes sniffing around the garden or being near you while you work outside. She would be a wonderful companion for anyone. Emma is house trained, and at night she wants to sleep at the foot of your bed, for company and to protect you. She is easy in a car, just finds a comfy place to sit and settles in. If the window is open she enjoys taking in the scents passing by. She likes to go for walks, and mostly goes with her people, off-leash. Once she bonds with you, she will follow you anywhere off-leash and will come immediately when called. Her on-leash experience is limited. Emma does not pull on-leash, but will zig-zag, and will need more on-leash practice. Other dogs are of interest for a few seconds, followed by disinterest. She seems to be great with other animals. When she walks by chickens and goats she gives a sniff, but leaves them alone. She is tempted to go after cats, however if her person tells he not to chase or to leave the cats alone, she will listen and come right back. She would need more supervision and management around cats, to learn not to chase them. She is very cautious and wary around people she doesn’t know, especially men. In general, she is scared, not yet recovered from whatever happened in her past. If afraid for herself, Emma will avoid people, staying several feet away. It will take time and patience, and only good experiences with people, before she will begin to feel more trusting and confident with people she doesn’t know very well. Food has been inconsistent in her life, so it causes some anxiety. She likes to eat and drink alone and outside. We put her food out and she waits for me to shut the door before she eats. If I open the door, she pauses. We tried many different places and scenarios and outside by herself ended up being how she is most comfortable. She loves our family and more than anything, she so wants to please and protect us. She may try to nip others, to stop them from what she perceives as threatening or dangerous actions towards her people. This can create issues when we have people over, and they move quickly towards us, or our girls, especially. From HITTGV: Emma’s current family loves her, but does not have the time to work with her. Because of their work and lifestyle, and Emma’s desire to protect her people, they are not able to keep her. Emma very much wants to please her people and do the right thing. Emma is trying to find her place in her family, and wants to do what her person wants, but she needs to be taught what that is. Currently, she is doing what she believes her job should be - to keep her family safe from the dangers of scary people. She thinks that protecting her little girls from a potentially harmful person she is her job/responsibility. She doesn’t know or understand that Grandpa chasing them was only play. Emma stopped wanting to chase a cat, when her current person told to not to. If someone is willing to teach her what they want, she will be the best, and most loyal companion you could want. She needs a calm, quiet, loving home, with someone who has the time, experience, and patience to help her overcome her fears, socialize her, and to teach her how to enjoy new experiences. 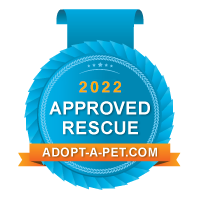 Our mission: To rescue, care for, and rehabilitate unwanted, abused, and neglected dogs of herding breeds, concentrating on Australian Cattle Dogs and Border Collies. Our focus is on their permanent placement into appropriate, loving homes, and informing the public about the special nature and needs of herding breeds. We are grateful for any contributions to help us rescue, care for, and transport animals. Herd It Through The Grapevine is a 501(c)(3) approved organization. Please click to donate a bed to our Shelter.